we are hard wired to connect with others…and nature…what is living…biophilia. I suffer the same, chris! So glad you brought up the nature connection… Was trying figure out how to work it in! Thanks for adding that important angle. I too was having a similar problem! Unable to stay “unconnected”. Having to check facebook every now and then — has someone messaged me? 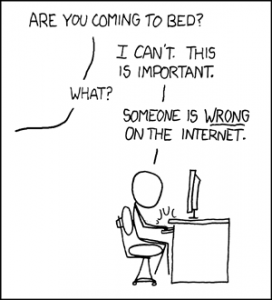 has someone commented on anything i posted? has someone posted anything? and so on….. 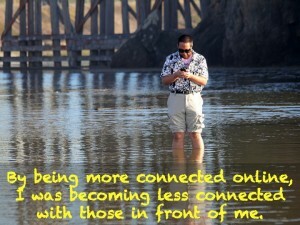 I began wondering whether my being connected was benefiting anyone, including myself! I use email. And that was quite okay. Checking emails twice/thrice a day. I deleted my facebook account on 2 September….and surprisingly i am not suffering from any withdrawal symptoms. Thank God! This is really hard for me. As a father of two adorable girls, I know you know what I go through on a daily basis, this intense desire to photograph, capture, and share the little moments of my son’s life that I may not remember in 20 years. Without some of the instant sharing tools like 23 Snaps and other quick-post platforms like Facebook, I wouldn’t be as efficient in noting his firsts- first tooth, first time standing alone, etc. Technology adds the convenience of date and time stamps and quickly noting those moments in ways I couldn’t find the time to do if I had to run to a baby book and handwrite them all. That being said, I don’t want him to think his Mom has a phone as a permanent attachment to her hand. So, we find balance. I will still use the tools, because keeping track of these moments and creating print photo albums and videos of his first year of life are really important to me. They might not be important to others, and that’s okay. I still read and cherish the baby book my mother created for me, and I love looking through my baby photos. Thanks for this post and important reminder! Thanks for commenting “Momma Hilty!”. (keep those pics coming because when I am on social media, I certainly make me smile). I really appreciate what you’ve said here, Chris, particularly the significance of having a clear focus based on what’s most important to you. I’m sure that most of your readers have struggled with being fully present for the people in front of them given the countless opportunities we have to be connected to a much broader world. Such “presence” requires both claritiy of intention and a clear explicit philosophy about what to include and exclude in the digital world, which is the subject of my blog post today. In addition, it requires that we have the discipline you displayed to eliminate apps (and devices) that diminish the quality of our relationships and personal and professional lives. Great post. Interestingly I did a similar thing last year removing myself from our district email system. This meant I simply posted an auto-reply that stated I would not be checking my email and providing my school phone number if parents and/or colleagues needed to contact me. You wouldn’t believe what happened… People began to actually come and talk to me face to face. It was fabulous! Instead of an email string of a dozen emails that frustrate, confuse, anger and disengaged me I was having conversations. Interestingly, many people would bring along a printed copy of an email to give to me stating they knew I wasn’t checking email anymore but this is what they had sent me. They seemed to have a real need to “send” me something. I am not a technology hater, I have a Masters degree in Educational Technology, I have a personal and class blogs, I am on twitter and Flickr but it was a great exercise to remove myself from the technologies that weren’t adding value to my life. The kicker is that while removing myself from my school email I didn’t miss a thing and seems to be more informed than many of my colleagues as I was having real conversations and not being lost in the cc chain. Could not agree with you more. During the summer, I rarely used my phone other than for real calls to speak with people. Of course, I turned to my laptop (and occasionally iPad) for Twitter or Facebook updates, but given I was not using the phone for these, I found I was interacting with people for real. Still, I noticed how often people were glued to their phones. My niece who stays with us every summer could not go anywhere without her phone, and checked constantly for messages. People are so addicted to texting and using phones for social media that they don’t even realize when they are walking into a tree, crossing a busy intersection, or putting themselves and others in harm’s way. Wow Chris. I was literally in the process of deleting the fb app when I saw this post. We seem to have the same track where I had started using social media for my business and now find I am filling my “empty space” by checking my news feed. I do learn a lot from pages I have subscribed to and try and only have people who post valuable content on but having it in my hand all the time is too much. Thanks for this, now I don’t have to write the article and will just use yours. We haven’t connected much recently, and that’s partly because I’ve been shifting my use too. I still have @replies on twitter come to my phone. To me, those are text messages. But I’ve seen a big downward shift in my overall online engagement. I have to be honest and say I miss it. But I know that I have the kind of personality that always wants to do more than I can and probably should do. The place you are modelling for me is the focus on family time. My hours are long and I still spend too much time on my phone at home. The challenge for me is email more than social media. Still, I needs this perspective to help me reflect and bring awareness to an issue I need to keep conscious of until my new practices are a habit. I appreciate your open sharing of this, Chris. Your honesty will help others who are trying to find their own suitable way to stay connected and learning online and deal with the pressure that can come with that. It is helpful to reflect and take time to ensure that our online connections are not affecting relationships with those closer to us. I have had my share of concerns about my own teenagers’ online connections/interactions and use of their phones. It has helped me take a step back and think about what I am modelling. As you referred to, if we as adults can become concerned about our own habits, what about our youth? I am not sure I am always heard, but I try to impress upon my own kids that true friends will be patient for their response and that many things can wait. 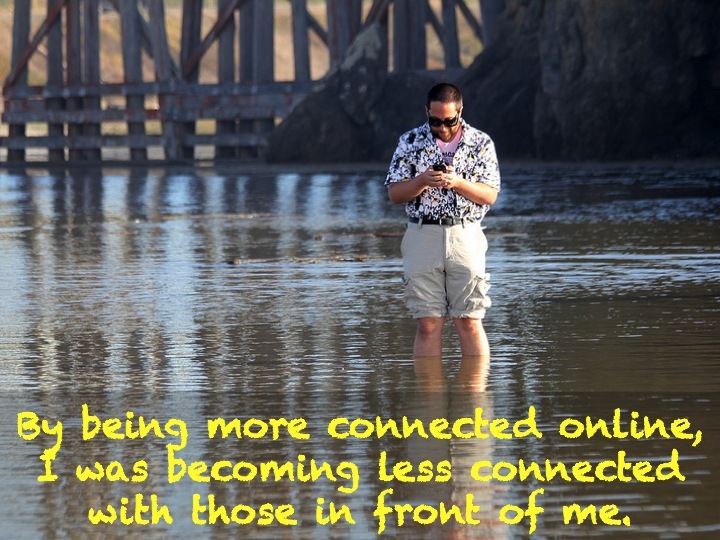 The instant updates and responses that our phones allow may not always be the most beneficial to us or others. Thanks for continuing to share both your successes and struggles as a connected educator! What a great read and great reminder. Just got my iphone so must admit I have been a bit in awe of its speed…bye bye blackberry…so with that comes your post which is a refresher to me that my daughter comes first…although she is 12 and often steals my phone….I will remember to steal it back and hide it from both of us. However, if not for social media, I would not have connected with you and the hockey pool guys in our admin. pool and for that I am thankful. Love your Wejr board and also the FOCUS reminder…focus on what is most important~always. Chris I can really align with this situation. We have a no technology time at our house. I was finding myself becoming obsessed with social media and the constant interruptions that phone notifications bring. Thanks for reminding me. A lot of people can align with your situation. I have seen what it does to people. Its almost as if people are joined at the hip with their phones. I shut down my facebook account a long time ago and ive scaled down on whats Ap messages since they both interfered with my ability to concentrate during the day whilst working and robbed my of my precious time at home. Its almost as though we’re not allowed to be disconnected. Then of course there are the ever intrusive and totally obsolete ADS we get bombarded with and lately twitter has started rolling out promoted ADS as well. The truth is that we were all just fine before all the social media rolled out in mass and we will be perfectly fine long after . I have a strong suspiscion that social media platforms are not really for our benefit. Thats my opinion. It is so true to the bone, it is scary. I took on the same task last november on my own phone. Turned off SM first, first week was tough. Extra time to spend of phone vanished!! Then i turned off email sync. I only opened email if i was out on site and i was waiting on an email from supplier or client. Definetly found more time!!! And yes, I found great relationships on SM like you too. Hard to balance!! For sure… never an easy balance. Email is now on my list to reflect upon. I need it on my phone during work days but I check it way to often when I am away from work. It does save me time when I check it and filter through my phone but also is a distraction. Still figuring things out! Thanks for commenting!